Suffice it to say, things are in a much better state in Arsenal-land right now than they were at this time last week. It's funny what two comprehensive road victories can do to your psyche. However, the job isn't done yet. And, thankfully, you could hear in Arsene Wenger's quotes from yesterday's presser that he knows the job isn't done yet. Arsenal should not take Fenerbahce lightly just because they won the first leg 3-0. There are still 90 minutes of football to be played. Let's get the job done, then move on to worrying about transfers / the North London derby / our existential woe / etc. Honestly, I don't have that much to say in this preview; it's Arsenal's third match in seven days and I feel like I've said it all in the past week. Somehow, Laurent Koscielny is fit and available for tonight's match at the Emirates, despite nearly having his head kicked off by Pierre Webo in the first leg last Wednesday. Initial rumors indicated that Koscielny might have had a skull fracture, which is clearly impossible, since Koscielny's skull is actually made of a rare titanium alloy that came from outer space and crash landed in central France in 1985. Other than that, there is no new injury news in the side; no new players missing after the Fulham win and no imminent returns from the already injured. I would expect there to be a very small amount of squad rotation to give a few players a break (as such, I'm not going to try to predict the starting squad,) but with so few first team players available to begin with, there's no way Arsene Wenger can go overboard with changes. The tie is poised at 3-0, not 8-0, so Arsenal cannot get too comfortable. There is very little information available in terms of squad news for Fenerbache, though I did find out that their volleyball team made a signing. So, you know, that's something. Both Arsenal and Fenerbahce won their respective league matches at the weekend, with Arsenal winning 3-1 at Fulham and Fenerbahce winning 1-0 against Eskisehirspor. Dirk Kuyt had Fenerbache's goal, in the 54th minute, while Mert Gunok saved a penalty six minutes later. Both clubs improved to 8th place in their respective league tables after having lost their opening weekend fixtures in shocking fashion. soil, at Old Trafford in 1996. Fenerbahce need a win by at least three clear goals to advance (and 3-0 would merely force extra time.) While Arsenal lost by two goals at home twice in the Champions League last year (to Schalke and Bayern Munich,) they have only lost by the margin Fenerbahce needs on two occasions in European competition: 3-0 to Inter Milan in 2003/04 (funny how that team wasn't as Invincible in any other competitions) and 5-2 to Spartak Moscow in 1982/83. Fenerbahce have not scored in either of their two prior trips to North London, losing 2-0 in 1979 and drawing 0-0 in 2008. Fenerbahce's only goals on English soil have come at Old Trafford, winning 1-0 at Manchester United in 1996 (their only win in England) and losing there 6-2 in 2004. In addition to Arsenal, Manchester City, Aston Villa, Newcastle United, and Chelsea have all kept clean sheets at home to Fenerbahce in European competition. Let's hope this doesn't happen again. The crew of match officials is from Spain; the referee is Carlos Velasco Carballo. Arsenal have seen Velasco Carballo twice over the past two years and have won both matches: 2-1 over Olympiacos at the Emirates in the 2011 group stage and 2-1 at Montpellier in last year's group stage (in which Montpellier opened the scoring from a dubious penalty.) 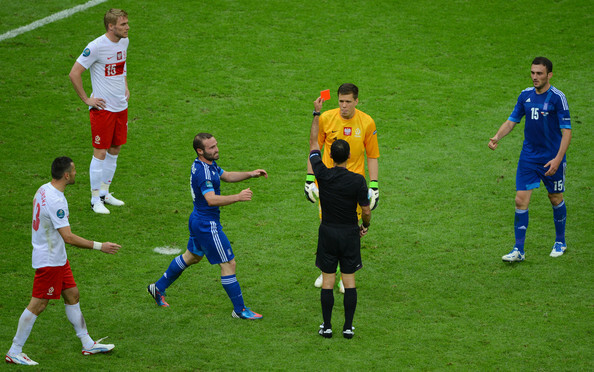 In addition to that, in international competition, Velasco Carballo was the referee who sent off Wojciech Szczesny in the opening match of the 2012 Euros. This will be his first Fenerbahce match and his second Champions League match involving a Turkish side; incidentally, that was against English competition, as Galatasaray defeated Manchester United 1-0 in Istanbul on November 20 of last year. Zenit St. Petersburg leads 4-1.